church members to tears after doing an unusual thing during service. 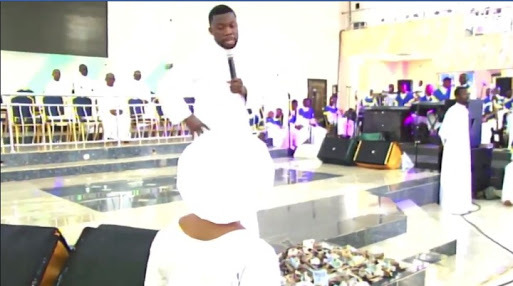 The cleric identified as Prophet Israel Oladele Ogundipe of CCC Genesis Global (Isheri Outreach), instructed a female church member to go away with all the offerings paid to the church by members during a Sunday service. The prophet said he was led by God to make the members of the church happy and the chosen woman was living in lack and sadness. 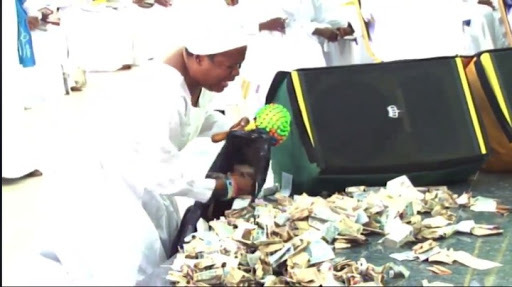 The rest of the church clapped and jubilated as the woman packed an undisclosed amount of money in a bag while shedding tears of joy. The emotional woman cried more as some other church members even came out to give her more money while she was still packing the cash the pastor gave her. The pastor said he doesn't want to have cars and many things, but that he wants to be blessed to bless others.